The Cats Tripe: The Prince is dead, long live the Prince! The Prince is dead, long live the Prince! 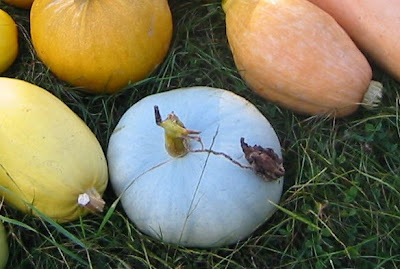 Pumpkins; Vegetable Spaghetti, Melonette Jaspée de Vendée, a poor example of Crown Prince and Pink Banana Squash. This picture from 2003 shows the last time I tried to grow Crown Prince pumpkins on the allotment. The seed had been saved from a purchased fruit a couple of years before and although several plants had given good results this last plant from the store was barely typical. The Crown Prince (Cucurbita maxima) pumpkin is an excellent culinary squash, keeps well and is not too big for a small family. The steel grey skin is hard and resistant to pests and the flesh is sweet and dense. For me, it qualifies as a variety that I would regularly grow as part of my core crops each year but I've been inhibited from doing so because all the seeds available in this country are listed as F1 hybrids. It is possible to save seed from such inbred selections but the subsequent generations may have weaknesses, flaws and loss of type that could take years to stabilise again. I was only prepared to grow these if I could find an open pollinated source of seed, but (probably) because these are such well known and commercially useful pumpkins that didn't seem possible. Seed merchants can spot a cash cow when they see one. However, the Prince didn't arrive from nowhere. It is actually a selection from a New Zealand cultivar grown around Whangaparaoa and known there as Whangaparaoa Crown. This is still a popular variety in the southern hemisphere and a good friend in Australia was kind enough to get me some seed from Eden Seeds so this year I will be growing them out with a view to selecting the best for my collection. I'd like to have a go at growing a crown prince, but I find if I grow too many different squashes they tend to cross a fair bit. Trying my hand at a giant pumpkin (Atlantic Giant)& Italian Butternut Squash (massive) this year. A system that worked well for me was to dig a pit and fill with manure, then use a plastic bottle in the ground to water straight to the roots. Apparently so, but the breeding isn't obvious or documented anywhere I can find. As I said, I'm going for Whangaparoa Crown as the potential source material and hoping to develop an open pollinated selection from that as an acceptable substitute. It's early days but the first year plants are doing well.